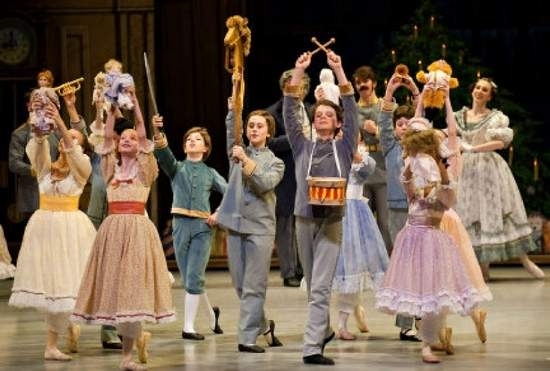 Since 1944, when the San Francisco Ballet premiered the first full-length version of “The Nutcracker” in this country, the piece, with its rich score by Tchaikovsky, has become the first experience many children have with live ballet. “It’s where people find inspiration to become dancers,” said Louisville Ballet artistic director Bruce Simpson. “The Nutcracker” has definitely influenced scores of girls to beg their parents for lessons, but as the Louisville Ballet School has seen, it’s also inspired boys. Simpson said the school has bolstered its efforts to train all young dancers over the years, but it also has been working to provide boys — who are much fewer in numbers at almost all schools — the teaching that they need to go on to professional careers. “The great ambition is to train dancers good enough to go into professional companies,” he said. While the path to becoming a pro can be long, it often starts with “The Nutcracker” and includes the production throughout the years of training and professional performances, as the following four male dancers represent. Barry Miller said he can’t quite get over the fact that his son, Henry, already has a résumé. It’s just starting to spill over one page with the titles of plays and the characters he’s played in performances from high school musicals to Actors Theatre of Louisville. At a young age, Henry showed a knack for performing, Miller said, which initially led him and his wife to sign their middle son up for auditions with high school plays not far from their Southern Indiana home. But Henry knew he needed more to excel on the stage. “I realized that if I wanted to be in more plays, I would need to know how to dance better,” he said. That someday wasn’t too far in Henry’s future. He had already been studying dance at Jeffersonville’s Weber School of Dance for a year when during the summer he went with his parents to an open house at the Louisville Ballet School. The visit convinced Henry he wanted to be there. “It was just like (the film) ‘Billy Elliot,’ ” Barry Miller said. Before long, Mikelle Bruzina, who had just retired as a principal ballerina to become the company’s ballet mistress, took Henry off to a rehearsal hall for about an hour to see what he could do. Now, with the holiday season approaching again, Henry’s in “The Nutcracker” playing Marie’s brother Fritz, who is a bit of a leader among the children and fights with his sister over her gift. The whole experience has energized Henry, who still manages to go to about two dance classes each week. “It’s exciting because Fritz does a bit more than the party children, and I get to dance by myself,” he said, adding that it means he has more complicated steps as well as some jumps to perform. In the New Year, and after the production closes, Henry wants to concentrate more on dance. One reason: he received some positive feedback to a video he sent of himself to some casting agents for the Broadway production of “Billy Elliot” and the boy wants to give it another go. Though Connor wasn’t in the production, Holloway, who is now artistic director of Music Theatre Louisville and Stage One, did bring his son to rehearsals. There he got to know the children in the cast and had a change of heart about the stage. The next year, Connor auditioned for the company’s production of “Beauty and the Beast.” He got in, and that set off a string of roles in MTL productions as well as others with Stage One and Derby Dinner Playhouse that put him on stages around town. One stage was the Bomhard Theater at the Kentucky Center for the Performing Arts, where he was in Stage One’s “The Best Christmas Pageant Ever.” With the run-up to the holidays, Connor got to peek in on a few “Nutcracker” rehearsals and was intrigued. Having played many dramatic roles in plays and musicals and taken some classes at a few dance studios, at age 12 he auditioned for “The Nutcracker.” And despite not being enrolled in the Louisville Ballet School at the time, he got roles playing a boy at a party and a young nutcracker. With encouragement from Louisville Ballet artistic director Bruce Simpson, he made plans the next year to audition for summer programs at other ballet schools. In the process, he and his father discovered that over one weekend in Boston, three major schools were holding auditions — the Boston Ballet School, the San Francisco Ballet School, and the Pacific Northwest Ballet School of Seattle. He was accepted to and offered full scholarships to the schools in Boston and Seattle, and decided to attend Boston’s program. Then, last summer, just as the program in Boston was coming to an end, the school’s director approached him and offered him a scholarship to study in the school’s full-time pre-professional program. From those 80 boys, fewer than 10 were asked to be in the pre-professional program, which Connor started this fall. He now lives in an apartment with another student and takes online high school classes through the Jefferson County Public Schools system — all while taking dance classes for sometimes more than eight hours a day. Today, Connor lives near Fenway Park and takes classes at the school in downtown Boston. He opted not to be in the Boston Ballet production of “The Nutcracker” this year, so that he can spend the holidays with his family in Louisville. But he wants to keep progressing as quickly as he has in recent years. That, he said, could have him working with the Boston Ballet’s pre-professional troupe in a few years. “Based on what my level is now, if I progress at a steady rate I can be there by the time I’m 18 or 19,” he said. “The Nutcracker” was key to Zachary Thomas setting out to what has now become a life dedicated to dance, and it happened during kindergarten when Thomas saw the ballet for the first time. “I remember there was a line of guys and they would throw the Snow Queen from guy to guy,” he said. His mother, Melissa Thomas, easily recalled that same performance. “We were in the second row and Zach said ‘I want to do that,’” she recounted. So she signed him up at age 6 for ballet lessons at a nearby school, where he danced for two years as the only boy there before his teachers suggested he continue at the Louisville Ballet School. There he was able to dance alongside other boys and study under professional male dancers. And he was able to dance in “The Nutcracker”— six times. He was a boy in the party scene and a rat, and he played Fritz, who is Marie’s brother, three times. Thomas was sold on ballet. “When I first started, it seemed like the coolest, most magical thing ever,” he said. But Thomas felt he was starting to waver a bit in his enthusiasm for ballet by the time he got to high school. During his sophomore year, he knew he loved dance, but wasn’t so sure about ballet. Thomas sought out the advice of some of the school’s teachers who were more steeped in the contemporary dance world and began a deeper exploration of that area of dance. By his senior year of high school, he decided he wanted to study dance at New York University. Since he moved to the city in 2008, he’s found “The Nutcracker” continues to be a part of his life. In the last two years, he performed the role of the cavalier who dances with the Sugar Plum Fairy and danced as the prince in productions in Connecticut. And this year, he’s even experiencing a demi déjà vu dancing in a contemporary version at the Manhattan Movement Art Center. It’s actually really wild to hear the music come on, because it’s so epic and your psyche from growing up in the ballet world brings back memories,” Thomas said. At the same time, Thomas has been more fully exploring contemporary dance not only in New York City, but also beyond this country’s borders. He’s studied at the Salzburg Experimental Academy of Dance in Austria, which was founded by a former dancer with legendary choreographer Merce Cunningham’s company, and with the renowned Batsheva Dance Company in Tel Aviv. Today, Peter Franc is a professional working with the Houston Ballet, but his mother, Barbara, said his chosen vocation is far from what she expected when he was 12 and the family was living in Atlanta. “He bristled at taking a ballet class,” she said. She had suggested he take ballet after he had been in several theater productions and wanted to learn how to dance better. Instead, Franc took a jazz dance class. After a year, a former prima ballerina of the Atlanta Ballet, Maniya Barredo, came to ask the boys at the school to participate in a “Nutcracker” production she was staging at the ballet school she ran. In the process, Franc also saw he could learn a lot from Barredo and, while taking lessons from her, fell in love with ballet. With her support, he also expanded his instruction when, at age 16, he attended his first intensive summer dance program with the Houston Ballet. But then his father got a job offer that would require the family to move to Louisville. Before taking it, he wanted to check out where his son could train and set out for the Louisville Ballet School. His mother said that meeting Alun Jones, the company’s former artistic director who was then running the school, helped him decide to take the job. Once in Louisville, Franc continued to excel and Jones took notice. He danced the role of one of the Chinese dancers in the 2002 “Nutcracker” production. “It was a huge deal for me because I was the only member of the school dancing a part with the company,” Franc said. In 2003, he danced in a piece Jones choreographed with him called “Mythodea,” a contemporary work Franc performed in during that year’s Southeastern Regional Ballet Association conference — where it won Regional Dance America’s National Choreography Award. That’s when he also began dancing more with the professional company. It took up so much of his time that he completed his high school senior year classes by correspondence. But while living in Louisville, Franc still took time during his summers to return to Houston and work with that company, where he landed after dancing as a pre-professional for the Louisville Ballet.